These limestone tombs, which date from about 250 BC, are painted to simulate alabaster and marble. They are decorated with pictures of Egyptian gods and daily life, along with graffiti, which also dates from the same period. The tomb lies to the south of the esplanade leading to the palace of "Ras el-Tin" and consists of five tombs, all dating from the first half of the 3rd century. They were discovered in 1901 and 1921. 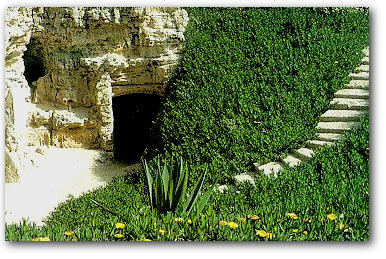 The first and most remarkable of the tombs is reached by way of a vaulted stairway hewn out of the rock, leading down into a square courtyard which is open to the sky and provides access to two tombs. The walls of the stairway and tombs have a painted stucco revetment imitating alabaster and marble. The vaulted ceiling of the funeral chamber is decorated with geometric "trompe l'oeil" designs reminiscent of the covered ceiling in certain ancient villas. The funeral motifs are an example of the combined influence of Greek art and the traditional forms of Egyptian arts.